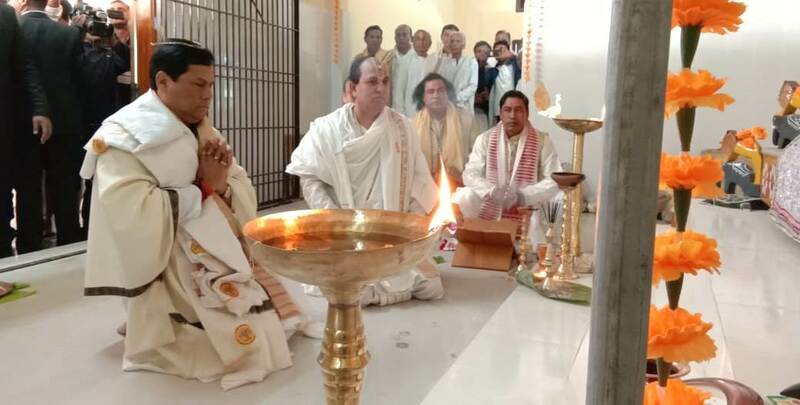 Chief Minister Sarbananda Sonowal offering obeisance at the newly set up branch of Sri Sri Auniati Satra at Bandardewa in Lakhimpur district on Sunday. Amidst protest against the Citizenship (Amendment Bill), Chief Minister Sarbananda Sonowal on Sunday said that BJP government has made all possible efforts to safeguard the interests of the indigenous people by following the ideals of the Gurus. Stating that the present government has come to power with popular mandate of the people of the state, Sonowal assured to continue working with upmost responsibility to secure the interests of the local people. The Chief Minister said this while taking part in an open session held on the occasion of inauguration of the newly set up branch of the Satra and the Cultural Centre at Bandardewa in Lakhimpur district. He claimed that mis-information campaign being unleashed by certain organizations on the proposed Citizenship (Amendment) Bill 2016. “People pay outmost respect to movements led by the non violent values of Mahatma Gandhi, mis-information always lends negative impact in society and such campaigns are always discarded by people,” he said. Sonowal said that though several governments came to power in the state as well as center after the signing of Assam Accord in 1985, no government made any tangible effort to implement clause 6 of the Accord safeguarding the constitutional, legislative, administrative interests of the indigenous people. Saying that the present central government has for the first time taken pragmatic steps for implementation of clause 6 by constituting a high level committee and also taking steps for granting ST status to six communities of the state, he said that the efforts would go a long way in protecting the interest of the indigenous people of the state. He also reassured that the state government led by him under no circumstances would take any step disguarding the interests of the indigenous people.